Why adblock walls don't work. And what's better? Why adblock walls don’t work. (And what works better). Adblock walls are everywhere today. We’ve all seen them. You arrive at one of your favorite websites and suddenly there’s a message covering your browser-window which asks you to disable your adblocker. Adblock walls are a natural progression of the rise in adblocking. What was once a small ‘fringe’ phenomenon led by college-aged geeks has gone mainstream.With 25% of desktop users now blocking ads, publishers have no choice but to protect their revenues. 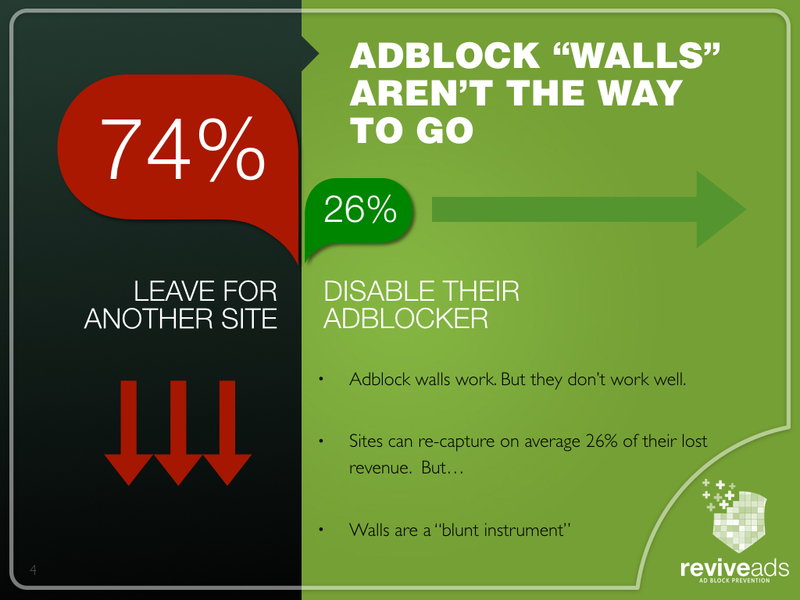 Statistically speaking however, blocking adblock users with a “wall” is a troublesome practice. Roughly 3/4 of adblock users leave sites that block them. The remaining 1/4 of adblock users disable their adblockers and enter the site. For most publishers that’s a Pyrrhic victory. Yes, one quarter of previously non-monetizable traffic has been regained. But the cost of losing readers is painfully high. The problem is that those 74% of lost readers are probably one of your most valuable demographics from a readership perspective. Adblock users tend to be under 40 years old, college educated and technologically savvy. From a marketing standpoint, that’s a prime market segment that you’re losing. Clearly, sending 74% of a high-value category of readers away, while “re-connecting” with just 26% of them is not an attractive or efficient strategy for re-monetizing adblock users. Clearly what’s called for is a more sophisticated solution: One which preserves user choice and doesn’t send adblockers away for good. Adblock walls are a binary choice: Whitelist us, or go away. That kind of non-nuanced approach is cumbersome and antithetical to the spirit of the web, where user customization and user choice are all important. At the same time, publishers have no choice but to up the ante in the war on adblockers. The numbers of adblockers are climbing sharply, as revenues are deteriorating rapidly. If 2016 was the year of the adblock “wall”, 2017 is shaping up to be the year of reinsertion. Reinsertion, to give as concise a definition as possible, is simply the act of “re-inserting” ads into the page placements which have been blocked. While some reinsertion technologies have been accused of robbing user choice, offerings like ReviveAds offer users significant adblocking choices instead of simply sending them away. By offering users a choice to either see ads, or opt for an alternate “ad light” experience, ReviveAds maintains a dialogue between publishers and readers and wins on two levels: Revenues are increased, and far fewer readers are lost. 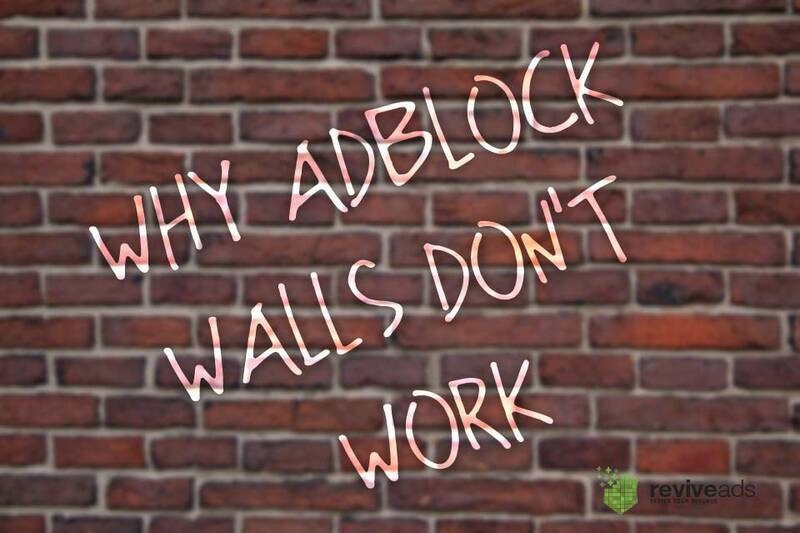 Adblock walls are ultimately a blunt tool compared to the more sophisticated approach of reinserting ads and then providing users with options on publisher’s terms. ReviveAds is the only ad block solution that combines Ad Block Circumvention with an industry-leading Ad Platform. Our platform has served over 10 trillion ads over the past 7 years. Ready to increase your revenue by 30%-50%? Contact us to leverage our cutting edge technology today. ReviveAds is coming to Vegas on January 6-8. ReviveAds Makes the news, on NewsWatchTV on AMC! Ad light is otherwise known as common sense or being sensible. Today we have to have fancy words for everything including common sense or nobody will go for it. The 2000s is known as the *buzz word* decade. However I do want to point out that it’s strictly a western culture thing as western culture is more and more animalistic the eastern world is getting more spiritual and having more *signs from God* events happening rapidly like the boy who painted Jesus from a vision after being hurt. Look it up and he didn’t even want to be famous!